The Moon is formed, most likely by a Mars-sized object, Theia, colliding with proto-Earth. In Greek mythology Theia is the mother of Selene, the Moon. The Moon is accreted from material ejected by the collision. 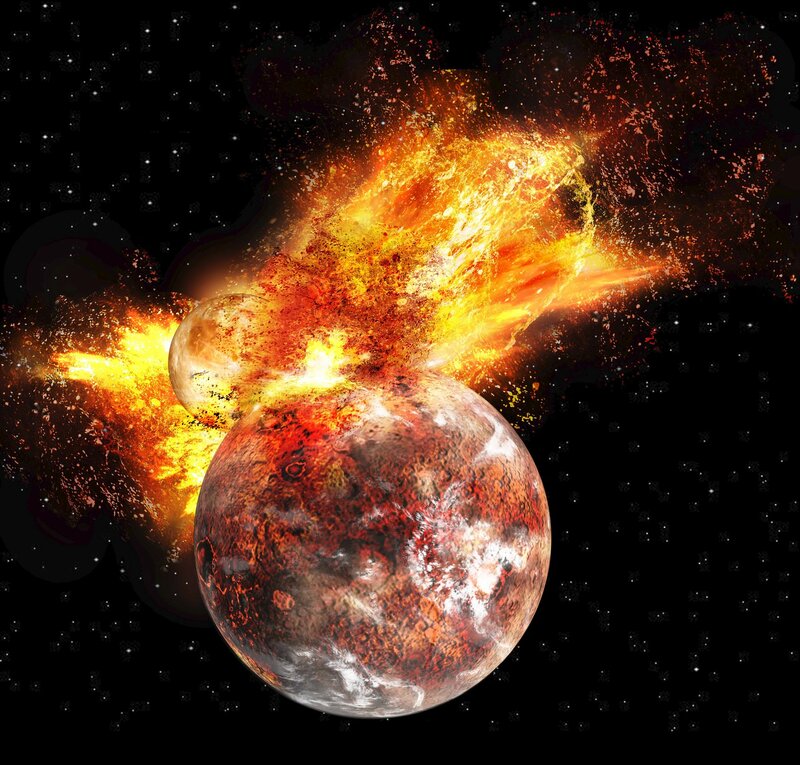 The Moon was formed, most likely by a Mars-sized object, Theia, colliding with proto-Earth. This was the last very large collision that hit the Earth. As a result, the outer parts of the Earth melt completely. Half of the planet becomes an extremely hot sea of magma. All the possible volatile substances on the Earth are instantly vaporized and blown away from the planet. This means that the water and nitrogen in the atmosphere come to the Earth much later, with asteroids and comets. The differentiation of Earth’s layers (core, mantle and crust) continued. The force of the Moon forming impact also fixed the tilt of the Earth’s axis to be 23 degrees. Ever since, this has determined the Earth’s seasonal variation, and thus has strongly affected the climate and the conditions on the Earth.